Who was David A. Conner, and why should we care? The initials stand for David A. Conner, born in Denton, Maryland in 1841, who lived the major part of his life in Delaware, including 38 years in Milton until his death in 1919. He was the son of cabinet maker William A. Conner (1818 – 1896) and Hettie Smith (1819 – 1881), both originally from Denton, residents of Frederica for most of their lives, and both of whom are buried in Barratt’s Chapel Cemetery. From the 1850 U. S. Census we know that the family moved from Denton to the Murderkill Hundred before 1850; by the 1860 Census, their post office was given as Frederica. We know very little about Conner’s youth before the Civil War, other than little hints he occasionally throws into his Milton News letter. In the October 23, 1908 edition, he describes himself as ..in early life a wild rollicking fellow: “a stranger to God, and an alien to the Commonwealth of Israel,” but let us hope the good deeds of a later life may, in part, atone for the misdeeds of a former one. This bit of reflection was occasioned by one of his trips back to Frederica, home of his boyhood; he gives us the impression of a boisterous, good-time chasing young man who did not care much for churchgoing. In an obituary for a personal friend who died in February of 1901, Conner mentions that he first arrived in Sussex County after the Civil War. According to an unpublished short story he wrote in 1889, Conner served in the Delaware 7th Regiment as an “Emergency Man,” for a thirty-day enlistment in July – August 1864; the Delaware thirty-day troops were called to defend key rail lines around Washington D.C., threatened at the time by Confederate forces under Gen. Jubal Early. 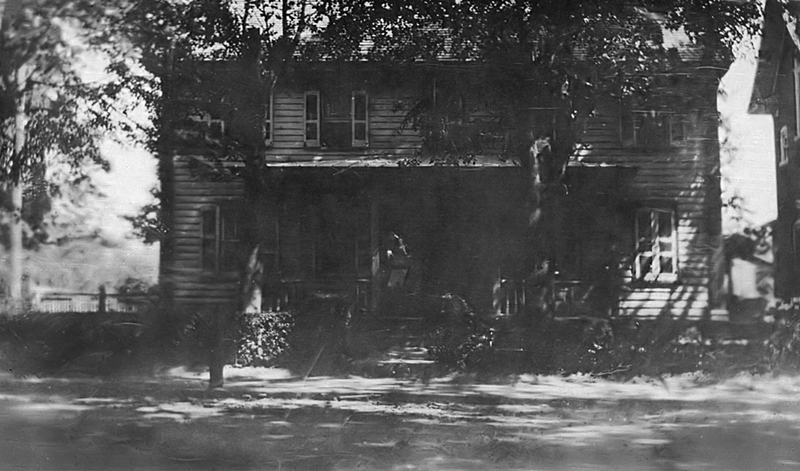 Stationed at Camp Bradford in Baltimore County, near Mankin’s Woods, it was there that he met his wife, Mary E. King (1845 – 1901), whom he married in February of 1865. In his unpublished story A Thirty Days Campaign, or alternatively titled The Little Maid of Mankin’s Woods, he describes the youthful Mary as auburn haired, with hazel eyes that pierced into his soul, and a lithe form. They would have eight children together, all of them surviving into adulthood. 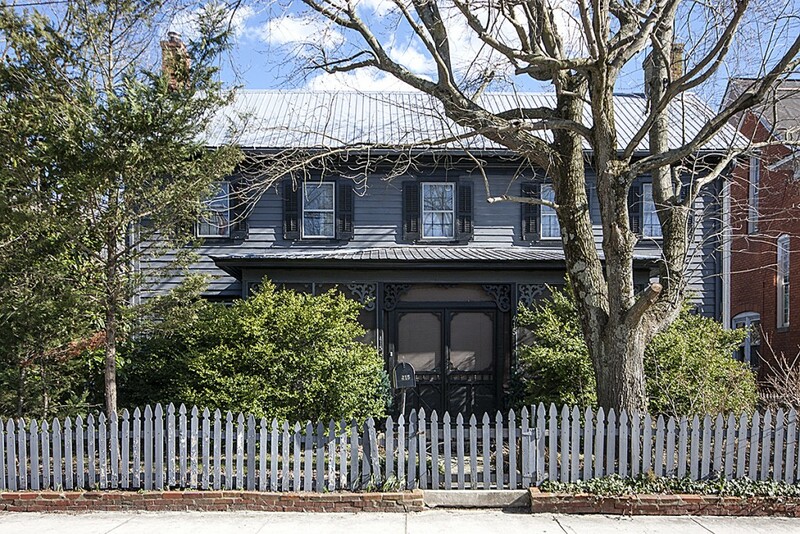 Most of his extended family remained in Frederica, but in 1870 he was living in Georgetown and by the 1880 census he was established in Milton. He is of huge importance to anyone researching the history of Milton in the late 19th and early 20th centuries. His weekly “Milton News” letter provided a highly idiosyncratic and often very entertaining narrative of life in his town. In the absence of other newspapers from that period and personal documents of the town’s residents, his weekly reports are one of the very few sources of information about mundane as well important events in that town, told by someone who had an abiding affection for Milton as well as a critical eye. This Monday morning, March 12th, 1888, is the worst morning I ever saw. A fearful blizzard is raging, and although the sun shines brightly, the flying snow is so blinding that at times once can scarcely see more than a few yards. I left my boarding house at 7 o’clock for my school, the distance being about half mile; during the short walk I never expected such sensations—the cedar trees along the road, some of them were blown up while others were twisting and bending, in the driving blast until their upper branches nearly touched the ground. I was nearly suffocated, and several times was surely tempted to lie down in the snow until the fiercer gusts were past. If I had, I should have been covered up. If I had stopped, or tried to stop, I should have been blown down. However I kept my presence of mind about me and went with the wind, whose impetus kept me in all kind of positions, mostly in a half run, and by making a detour, reached the school house. Fortunately the snow is not deep except where it is banked, and that is against every object small and great that is exposed. It is useless to add that I am the only one at school today. My pupils have more sense than to come. Nevertheless, I am very comfortable. I am writing now; directly I shall teach an imaginary class in history with profuse blackboard diagrams as per instruction at our institute. I wonder if this is the blizzard that Mr. […] Paynter wrote up last week in the Delaware Democrat. This don’t tickle our [….] being, that did our intellectual faculties. As it turns out, the snowstorm he struggled to walk through was the Great Blizzard of ’88, the worst ever recorded in the Northeast and Mid-Atlantic region. He experienced the wind gusts of up to 45 mph, but Delaware was spared the big snowfall of 20 to 60 inches that fell in New England and the Northeast. The severe weather resulted in a general paralysis of transportation and communication from Maine to the Chesapeake, 400 fatalities, and $25 million in property damage (about $660 million in today’s dollars). He revealed in September 1892 that he was in the U.S. Quarantine Station at Lewes, not offering an explanation but implying that it was not by choice. We can’t be sure whether it was his unspecified “heart trouble” or the “temporary blindness” (cataracts, perhaps?) that was the cause of the long interruption in his writing that lasted from 1893 to at least part of 1894. Other writers substitute for him, using the bylines “Max Wax,” “Friend of Max Wax,” and more than anyone else, “G.W.A.” (George W. Atkins). In the May 3, 1895 Milton News letter Conner writes about his “returning to America” after an absence of seven months, but does not explain what that really means. 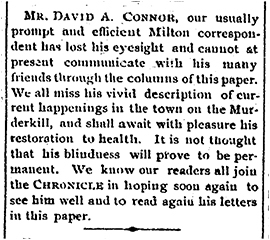 There are no surviving copies of the Milford Chronicle from the year 1894, so we don’t know if or when Conner resumed writing the letter, and why he took a seven month hiatus. George W. Atkins took ovcr the task of writing the Milton News letter in mid-June 1985, just a month and a half after Conner began writing again; we can only guess as to why, but later on that year George W. Atkins writes that Conner was engaged to teach school in Concord. 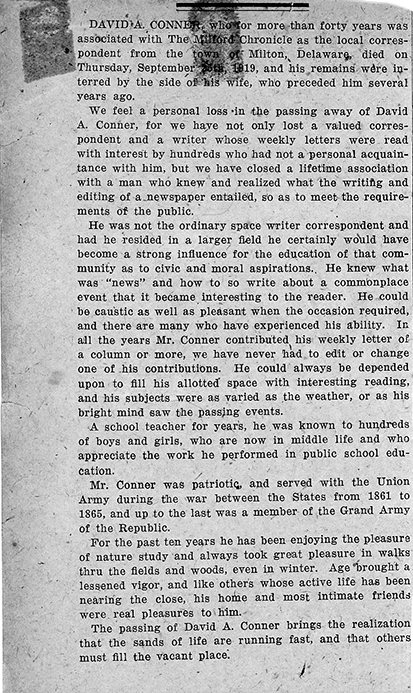 There are no surviving copies of the Chronicle for the years 1897 – 1900, on paper or on microfilm, so we don’t know exactly when Conner resumed his reporting full time, but by 1901 he was writing every week. Conner was listed by the Wilmington News Journal of March 26, 1910, as an enumerator (census taker) for the 1910 U. S. Census; he makes mention of that fact in his own Milton News letter. There was no pretense of dispassionate journalism in his work; David freely expressed his personal opinions on town matters as well as individuals with sometimes droll, sometimes acerbic commentary. 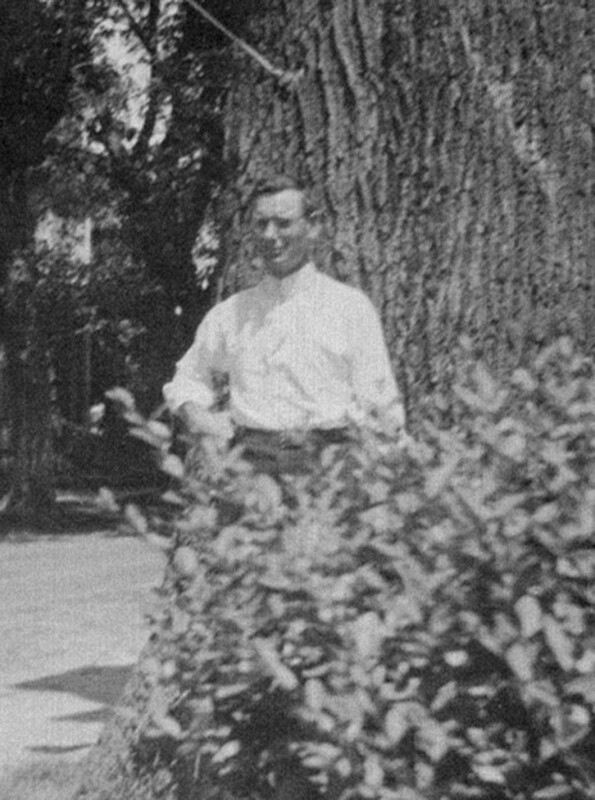 As many town correspondents did in those years, he reported on the comings and goings of visitors and residents, recounted the guest lists of social gatherings, announced births and deaths, and provided agricultural news and reported on transportation issues. He also devoted a great deal of space to the activities of the Milton M. P. and the Goshen M. E. churches, which is of critical importance in reconstructing the renovation time line of the former. For the history of the stained glass windows, he is the only source of information on planning, startup, and completion of the various stages that we have. Thou hast all seasons for thine own – O, death. The poem is an appropriate lament of the sudden, inexplicable demise of nineteen-year-old Mary E. M. Atkins, idolized by her parents and popular with her peers. However, Conner quoted the first line from this poem year after year, always at the beginning of autumn, when he would note that “Leaves have their time to fall…” quite literally, and Milton housewives were busy raking up and burning fallen leaves. When you look at the body of poetry and literature that Conner draws upon over a period of years, what is most noticeable is what is missing: Shelley, Keats, Milton, Homer, Dante, Wordsworth, Spenser, Marvel, Melville – are almost never referenced by him. He throws in a Shakespearean reference or two, most often to King Lear, and one to Lord Byron’s Childe Harold’s Pilgrimage. One work of popular “science fiction” of the day – The Goddess of Atvatabar – is referenced at least twice, along with Lew Wallace’s Ben Hur. The overwhelming majority of the other literary sources are works that were anthologized for school children and taught in 19th century classrooms for their moral and religious messages. Felicia Hemans is in that didactic category, although her work is a cut above the rest. David A. Conner was not a student of literature; my contention is that he drew his inspiration from the school curriculum that he was required to teach as a young man in the primary schools of Kent and Sussex Counties. As a regular Methodist Episcopal churchgoer, his other main influence was the Bible, both Old and New Testaments, and one will find his letters peppered with fragments of Biblical verse. His writing style is often pedantic, which is not surprising of a former schoolteacher. I would hasten to add, however, that to his readers he would appear quite scholarly when one considers that a high school education was a rare achievement in the late 19th and early 20th centuries. He does make amends for the pedantry when he gets down to earth and writes with a wry humor about his fellow townspeople, or with a profound sense of loss, as he did in his letter of October 30, 1903. In that issue, despite throwing in the reference to the song Ben Bolt and the poem In School Days, in both cases unnecessarily, he reveals an all too human grief at the death of his wife two years earlier. David exalted womanhood with a true Victorian flair, and at the same time took a gentlemanly but very firm position against women’s suffrage. He indulged in the same racial stereotyping of African Americans that was pervasive in his time, and was condescending to the foreign workers who staffed the canneries in season (even as he lauded the latter for their willingness to work very hard). But then he delivers a harrowing eye-witness account of the disastrous fire of August 12, 1909 and excoriates the town council for failing to act before the next disastrous fire two years later. For a handful of Milton residents, David A. Conner provided a much closer look at their characters and foibles. For example, his review of the 1906 theatrical presentation by Fannie Leonard and her Sunday school students – a play titled “The Oxford Affair”, whose ticket sales funded the “Sunday school” window in the M. P. Church – supplied the only direct impressions of these young women that we have. Genealogical tools cannot reveal that Fannie Leonard delivered her character with “a majestic mien and queenly bearing,” or that Viola Magee “came upon the stage dainty as a piece of Dresden [china] tuneful as a mountain brook….” or that Edith Morris could put on a good Irish brogue. Perhaps the best such portrait is the one he paints of William G. Fearing, a house painter and paper hanger. Fearing appears to have been a personal friend of David Conner, because the correspondent wrote about him very frequently, even about trivial matters. It is from the weekly letters that we learn that William, a veteran of the U.S. Navy during the Civil War, was much in demand as a public speaker on Decoration Day and July 4, besides being a licensed exhorter in the Milton M. P. Church. We also know whose homes he painted, and that he had a sly sense of humor. Conner added the title “Professor” to Fearing’s name in many of his columns; to the name of James Leonard, a laborer and Fannie Leonard’s father, he added the honorific “Doctor”. Neither of these two men ever made it as far as high school. He spoke of the Milton “Sorbonne,” which can be interpreted as the equivalent of the country store cracker barrel, of which James Leonard and William G. Fearing were the senior faculty. The members of the Milton “Sorbonne” were not fettered in their imaginations or in their argumentative spirit by a lack of formal education, expounding as they did on myriad subjects. 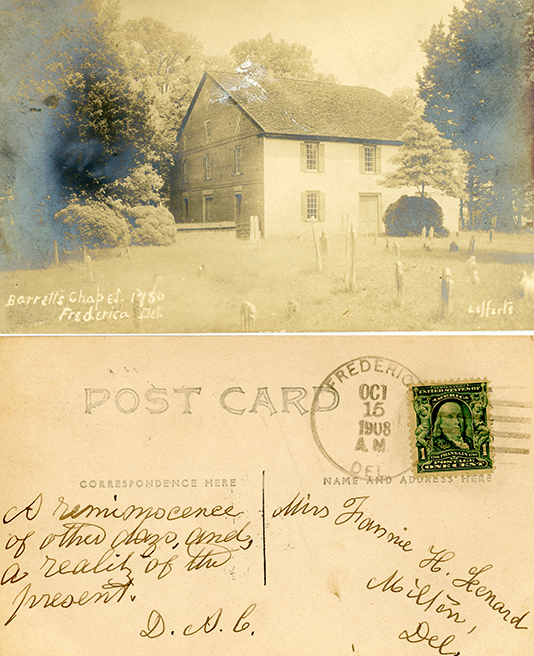 We have several documents written in David A. Conner’s own hand: draft and revised manuscripts of A Thirty Days Campaign, written in 1889 or 1890 but never published; the poem I Have No Home Since Mother Died, written in 1888, also unpublished; and a postcard he mailed from Frederica, on one of his periodic visits, to Fannie Leonard in 1908. David A. Conner died at his home on Federal Street, this town, quite suddenly on Thursday evening, September 25, of heart disease. Mr. Conner had partaken of a hearty supper and was sitting in his chair smoking, as was his custom. He remarked to his daughter, Mrs. Emma Johnson, that he had a severe pain in his left side. She summoned a physician but Mr. Conner died before medical aid could be rendered. …………He moved to Milton about 40 years ago. In his youth he taught in various schools in Kent and Sussex counties. For many years he has been local correspondent for the Milford Chronicle, and his weekly letters were looked for and appreciated by not only Miltonians, but many former residents who have scattered pretty well over most of these United States. A writer of considerable ability, who, had he turned his talents in the direction of composition, might have made his mark. We have only a handful of unpublished manuscripts that hint at a higher literary aspiration: A Thirty Day’s Campaign, a poem in memory of his mother, and another short story. In our contemporary parlance, he was a columnist or a pundit, much more than a local correspondent. The only fact that the editor gets wrong is Conner’s Civil War service: he was not in the Grand Army of the Republic for the duration of the war, but a thirty-day Delaware “emergency man,” as his own memoir, A Thirty Days Campaign, attests.